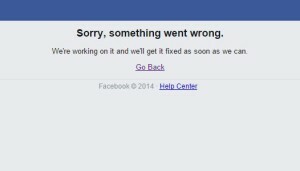 If you are experiencing issues connecting to Facebook and Instagram, both on the Web and via mobile apps, do not blame your Internet Service Provider, both services are down right now. Currently, when you try to access Facebook on the web, you will receive a notice informing you that something went wrong and they are getting it fixed. It’s not clear what’s causing the outage, but facebook-owned mobile messaging service WhatsApp is running as usual. We will keep you updated with more details as they come in.